Born into an Irish-Catholic family, Mary Clarke was raised in the exclusive community of Beverly Hills, California. Her father became a very successful businessman and provided well for his family. Privileged lifestyle not withstanding, it was a common practice of the family to care for those in need. In her early years, she participated in a variety of help programs, such as sending medical supplies across continents to aid the suffering in Africa, India, Korea, the Philippines, and South America or providing assistance to the United Farm Workers movement. First married at a young age, Mary eventually raised seven children in two marriages. Not content with just raising a family, she was also heavily involved in charitable activities, all the while running her deceased father’s business. After twenty-five years of marriage, and after most of her children were out of the house, she drastically changed her life. 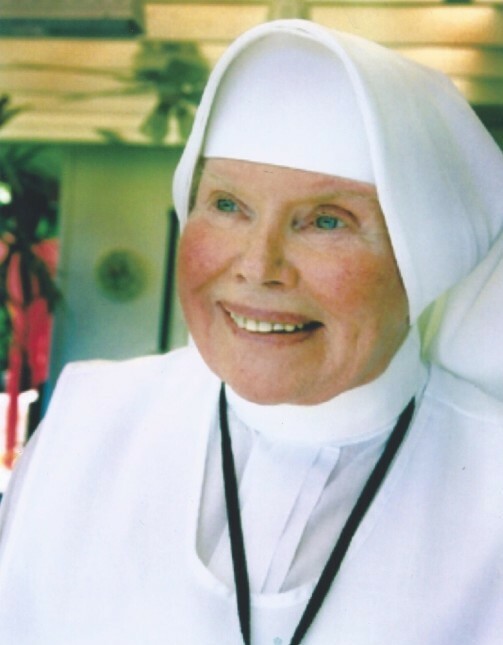 In a period of just a few years, she divorced, sold her home and possessions and began to serve full time the prisoners at La Mesa penitentiary in Tijuana, Mexico, and with permission to take private vows, she put on a religious habit. After a year, her service to prisoners came to the attention of Bishop Juan Jesus Posadas of Tijuana and Bishop Leo Maher of neighboring San Diego. She was officially welcomed and blessed by both Bishops: Bishop Maher made her an auxiliary to him while Bishop Posadas made her an auxiliary Mercedarian, an order which has a special devotion to prisoners. At age fifty, she had become a sister. At the La Mesa penitentiary, she lived in a 10’ x 10’ concrete room with a cot as her bed, and with a Bible and Spanish dictionary nearby. Sister Antonia provided not only spiritual guidance to the guards and inmates, but continued to help with basic material comforts for prisoners such as blankets, toiletries and medicines. In 1997, Sister Antonia’s mission expanded. Many had heard of her ministry and offered to help and some even wanted to follow in her footsteps. With encouragement from the Bishops and many other supporters, Sister Antonia initiated the process of forming a religious community. It was to be known as the Eudist Servants Of The Eleventh Hour. In 2003 the community was formally accepted by the Bishop of Tijuana. After almost three decades of service, Mother Antonia Brenner called Tijuana her home. She condemned crime, but loved the sinners and the victims. Her love and guidance made a difference at the prison and as a result many who were imprisoned there have sought a better life. Thank You for the precious gift You have given me this morning–my life–to live fully and joyfully one more day! Please give me the grace to be kind and patient today that I may see beyond worldly appearances, so that I may encounter Your holy presence in each person I meet. Close my ears dear Father to all gossip. Seal my lips to all judgments and criticisms that my words will only bless all about me and warm the coldest heart. Let my actions be so just, my feelings be so tender, my conduct be so humble and true to Your will that throughout this day I will be a reflection of Your heavenly mercy and love. Amen.